You are here: Home / clothing deals / Old Navy Denim Sale: prices start at $10 for kids and $19 for adults! 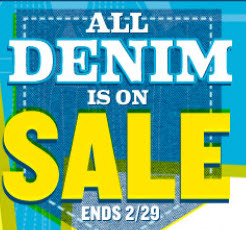 Old Navy is having a denim sale. Prices start at $10 for kids and $19 for adults! You will get free shipping when you spend $50 or more online. When you shop online, you can also get up to 10% cash back from ShopAtHome.com. They also have lots of kid and baby items on sale for just $5! If you are shopping online, you can also save 15% off any purchase or 20% off your total purchase of $100 or more when you enter the code ONSAVEBIG at check-out! Old Navy: Save 25% today + get 3% cash back! Old Navy: Save 50% online or 75% in stores + earn SUPER CASH! Old Navy: Save 20% off your total purchase + 3% cash back! Old Navy: Up to 20% off + 15% cash back + free shipping! Gap & Old Navy: Save 30% + get 3% cash back! Old Navy 30% off sale: Girls PJ pants for as low as $4.18 and more!